Finally winning the battle against weather and technical glitches that delayed the mission into the new year, a Titan 2 rocket successfully lofted the U.S. military's Coriolis research satellite into orbit Monday to mark the first space launch of 2003. Originally slated for December 15, the launch from California's Vandenberg Air Force Base was scrubbed four straight days last year by persistent bad weather, a concern with the system used to deploy the satellite from the rocket and a software issue with the spacecraft. A fifth attempt Sunday was thwarted by unfavorable high-altitude winds. But the sixth time was the proverbial charm for the Air Force and Lockheed Martin launch team as a smooth countdown culminated with liftoff at 1419 GMT (9:19 a.m. EST; 6:19 a.m. PST). Five-and-a-half minutes later, the refurbished Titan 2 Intercontinental Ballistic Missile put the Coriolis spacecraft into orbit above Earth. Still attached to the rocket's second stage, the satellite flew around the south pole and the headed northward for Africa when the Titan 2 performed a two-minute firing of its attitude control thrusters to raise the orbit. At about 59 minutes into the flight, the 1,798-pound spacecraft was deployed from its launcher into Sun-synchronous orbit. Controllers made contact with Coriolis via a ground tracking station, gathering information that showed the Spectrum Astro-built satellite was alive following its ride to space for a three-year voyage. Data from the satellite also showed the power-generating solar array had been deployed. Over the next week, the craft will maneuver itself into the final operational orbit about 450 miles up. The $224 million Coriolis mission carries the Navy's Windsat microwave polarimetric radiometer and the Air Force's Solar Mass Ejection Imager. The Windsat payload aims to gather wind speed and direction measurements at or near the surface of Earth's seas. Such information promises to benefit the Navy's planning of operations and improve weather forecasting. "We are very, very interested in wind direction and wind speed, not only from a safety of operations standpoint but from the tactical exploitation of the atmosphere -- what direction do you steam the battle group to launch, which direction do you have your underway replenishments in, which areas do you avoid. So this is an operational sensor," Navy Capt. Bob Clark, manager of meteorological and oceanographic programs, said in an interview. Windsat offers an advance in space-based technology by combining accurate wind speeds with direction information. "The radiometer technology has progressed from being relatively accurate with respect to wind speed and no accuracy with respect to wind direction up until the point of flying this sensor," Clark said. "Now we will have a very accurate wind speed combined with a very accurate wind direction." Scientists have "great expectations" that the sensor will increase the accuracy of predicting where hurricanes and typhoons will go, Clark said. "It's one thing to know wind speeds but those core wind directions are absolutely key to the successful forecasting of the movement of something that dangerous." The Solar Mass Ejection Imager will provide an early warning of coronal mass ejections from the Sun that impact Earth, disrupting communications and power grids. Mission officials say the system should give one to three days notice to prepare for impending geomagnetic storms by tracking the ejections as they head for our home planet. "This tool is designed to improve our ability to observe the Sun's magnetic and particle storms earlier than we can today," said Air Force Col. Richard White, director of the Department of Defense's Space Test Program. "Early warning of these coronal mass ejections will enable communications and power transmission companies to take precautions well before the storm reaches its peak. For warfighters, early warning can help us prepare for communications outages and protect our troops in the field through mitigation efforts." The Titan 2 used in Monday's launch was one of 14 ICBMs converted by Lockheed Martin to serve as a space launch vehicle. It stood in an underground silo, topped with a 9.6 megaton nuclear warhead, at Davis-Monthan Air Force Base in Arizona from 1967 to 1982. The launch team named the rocket in honor of Nathan Hewitt, an Air Force Academy cadet killed in traffic accident. "He was by all accounts a rising star in his own regard. He had a lot of promise," said Air Force Launch Controller Capt. Dan Wetmore. 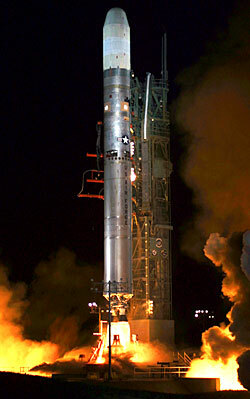 Coriolis was the largest craft launched by the Titan satellite launchers, which have all flown successfully since 1988. To accommodate the tall satellite, the rocket used a 25-foot long nose cone for the first time, officials said. For the Titan team at Vandenberg, focus now shifts to the mid-May launch of the Air Force's DMSP F-16 weather satellite aboard the final Titan 2 rocket mission currently on the books. 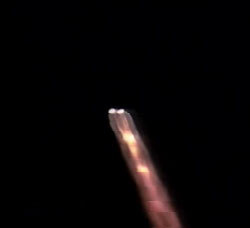 That launch has been delayed two years by an assortment of problems. Twice before the rocket has been assembled on the pad only to be destacked to make way for another booster. Mission preview - Our story giving an overview of the launch. 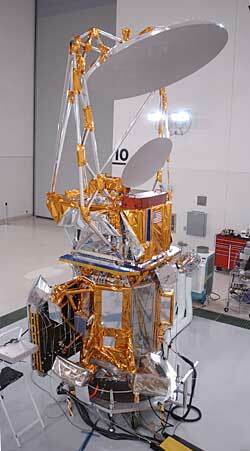 Coriolis - General overview of the satellite and its two instruments.